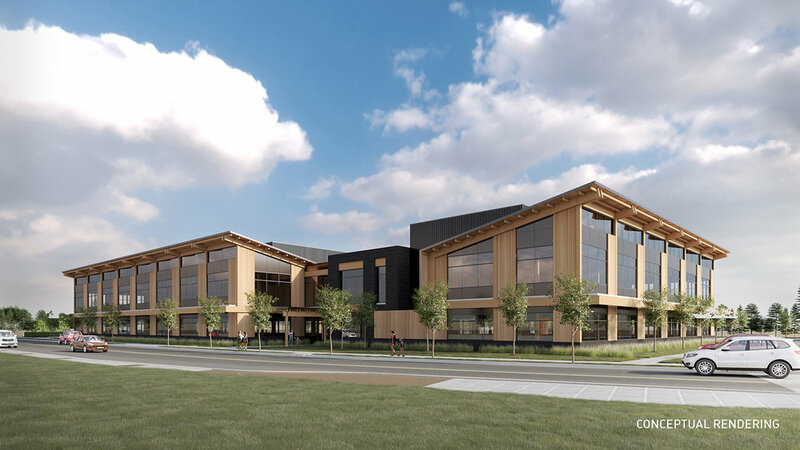 It was announced February 26th that the future home of the regional Department of Human Services (DHS) office would be located at TimberMill Shores. Approximately a year ago, there was speculation of a new state office building proposal, to be located within the central business district of Klamath Falls. Since then, we have fielded many calls from developers wanting to locate that very building here at TimberMill. The reason for all the developer interest was because these astute developers recognize TimberMill as having the best location for the new building. The location offers great access to other downtown businesses, public transit system, geothermal heated sidewalks, waterfront walking and biking trails, and future home to other office buildings, restaurants, and upscale housing. Out of all of the developer interest, TimberMill Shores ultimately chose Rubicon Investments. Rubicon Investments has a history of creating quality developments. Their proposed building will be one of Klamath’s finest when it is complete. Rubicon and their team are long term building owners. They are not simply interested in completing a project only to sell it. 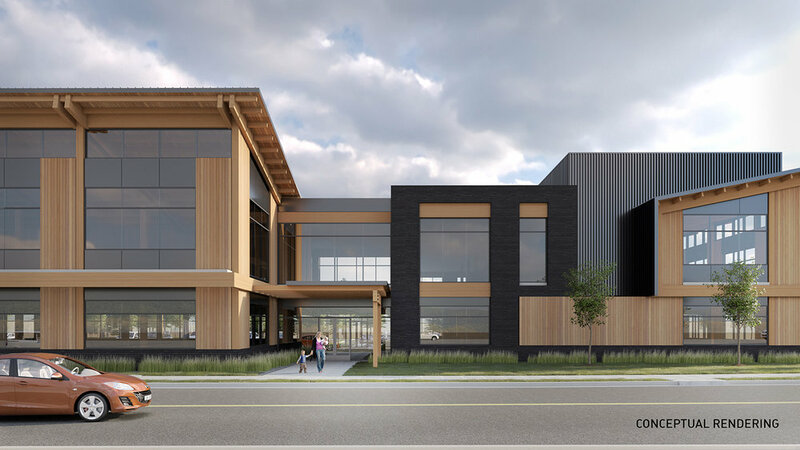 Rubicon’s long term holding strategy is appealing for TimberMill and their approach is represented in the quality of the building they intend to build. Please see www.klamathfallsholdings.com for draft elevation drawings along with specific information and updates to this project. TimberMill Shores representatives have remained silent over the past month, regarding the comments made by Klamath Works supporters. Since the announcement local supporters of the Klamath Works project (a competing site for the States bid) have been very vocal about their personal opinions. They believe that the site is not a good fit for the future DHS office. They also claim that the State did not follow the proper procedures or scoring when selecting the sight. TimberMill Shores representatives believe in the dream that Klamath Works has for their community services campus, but does not believe that the DHS office should be housed at their location. 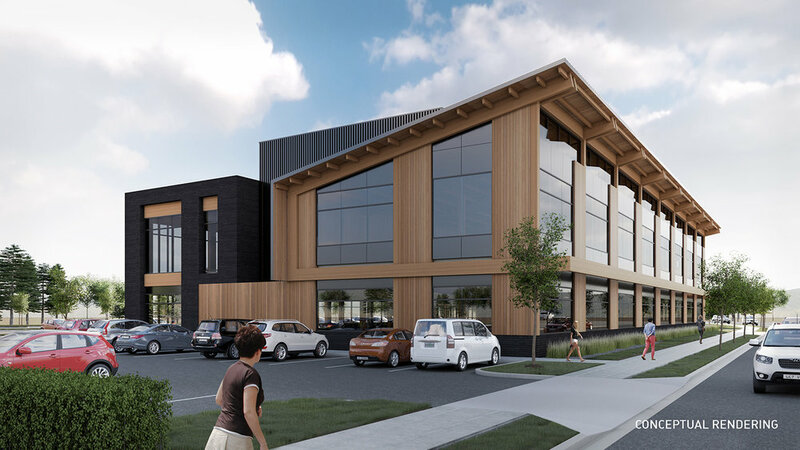 Rubicon Investments, the selected building developer and TimberMill Shores location, offered far more benefits in their bid for the new government leased office. The Department of Administrative Services (DAS) represents State agencies in securing and negotiating bids from private developers. In this case, the State was seeking land for a large office building to consolidate DHS employees. Among other criteria the State considers, the State specifically asked for a location within the central business district or downtown Klamath Falls. The bids are submitted, by private developers or contractors, to the DAS who handles the bidding process and negotiations for State agencies. In this case, the State only leases space within the building and does not own the building nor the land. The DAS first outlines criteria for what they are seeking and then publicly announces the project, and sets forth a deadline for submittals. Then DAS secures any, and all, bids from private contractors and developers, and then proceeds through a very long process with the officials from the State analyzing each submittal. In the case of this DHS building proposal, the individual sites were submitted and each site was ranked. The DAS looks at criteria one of which such is location. TimberMill is centrally located within the Central Business District (which was a request of the State). Timbermill is also located adjacent to the courthouse, bus transit, and within walking distance to restaurants for the convenience of its employees and customers. TimberMill Shores was ranked highest amongst all the applications and therefore was awarded the bid. Klamath Works overall score was sixth out of nine sites. recognized the uniqueness of this property, but also the economic and social impacts it could have to our community. It was discovered that the property had some environmental issues. Instead of leaving the site idle, work immediately ensued with the Department of Environmental Quality to resolve these environmental issues. This was a very long and arduous process that took hundreds of thousands of dollars and years to complete. An investment or risk that not many would have been willing to take on with a town that has historically struggled with growth. TimberMill then created Klamath’s first mixed use zone, platted the property into individual lots and constructed two new roadways within the first phase of TimberMill’s 50 acre development. Mixed use zoning allows for a mixture of retail, commercial office, government office, residential (townhomes/condos) and light industrial. Office space or more to the point, its workers, are an important component of mixed use. Some of these very employees could be living here and enjoying the benefits of a mixed use community. The idea behind mixed use is to foster a live, work, play type environment. It promotes pedestrian traffic or movement rather than vehicular. In addition to standard utilities for every lot, TimberMill invested heavily into its own geothermal system that is tied into the City Geothermal system. TimberMill’s geothermal system has enough capability to provide heat to all sidewalks and buildings within the development. geothermally heated walking/biking path. Public space and lakefront access donated in perpetuity. The 2 acres donated for Veteran’s park expansion has already been constructed. Through an Oregon Department of Transportation grant secured by the City, trail work is now underway along the lake. Many have asked, why hasn’t anything else happened in TimberMill? The short answer is, we are just now emerging from a very long recession that crippled even the strongest markets and cities across the country. Klamath, unlike other cities, has still not completely rebounded and attracting any interest from new business, to our area, has been nearly impossible. However, the news of TimberMill securing the bid for the new State office building couldn’t have come at a better time as Klamath’s economy is just now showing signs of life again. We are fielding new calls once again, and it is likely that the news and construction of this very impressive office building, will spur other developments around it. 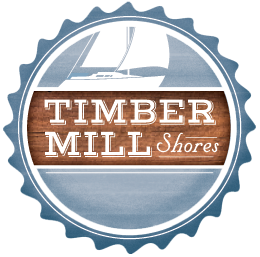 More information can be found at www.timbermillshores.com. Press release provided from Timbermill Shores. More information on the proposed Oregon Department of Human Services Building.